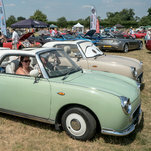 Home NY Times Britain Dispatch: This Quirky Car Is Japanese. But There’s ‘Something Very British’ About It. Owners join Figaro clubs and Facebook groups, give their cars names, often buy more than one per family, and sometimes pay over 10,000 pounds, or $ 12,500 — more than the car cost new. The company originally planned to build just 8,000 Figaros, priced at about $ 8,300, and strictly for the Japanese market.